When Hitler rose to power in early 1933, he owed much of his success to the muscle of his Nazi Storm Troopers, the SA (Sturmabteilung), a violent, ruthless army headed by Ernst Röhm, Hitler’s long-time friend and devotee. Röhm and his Storm Troopers brought Germany into submission by gaining control of the streets ganster-style and violently eliminating any of Hitler’s political enemies. However, by 1934 a threatening, revolutionary force such as the SA was no longer useful now that Hitler was firmly in power. Hitler wanted to “go legit” and win over the regular army generals, the leaders of industry, as well as the German people. Most everyone in Germany disliked the SA, who were seen as the arrogant, bullying, murderous thugs that they were, and Hitler knew he needed to curtail their power to increase and solidify his own. In April of 1934, Hitler and the head of the German army, Werner von Blomberg, signed a secret agreement. Hitler promised Blomberg’s army absolute control of the military (with precedence over the SA); and Blomberg pledged the army’s backing when Germany’s 86-year-old president Paul von Hindenburg inevitably shuffled off the mortal coil and Hitler claimed the presidency. Röhm had made powerful enemies in the Nazi party, among them Heinrich Himmler and Herman Goring, who were part of the SS (Shutzstaffel), an organization that acted as Hitler’s personal body guards. They began putting the bug in Hitler’s ear that Röhm was planning a coup, and even gathered false evidence to back up their bogus claim. The SA was becoming agitated since their role had been curtailed so severely, and tension was high between leaders of the German army and the SA leadership. Even still, Hitler was hesitant to move against his old buddy Röhm. When Hitler met with German President Paul von Hindenburg on June 21, 1934, the old man was in very poor health and was confined to a wheelchair, but his mind was sharp as ever. He brusquely informed Hitler and Defense Minister Blomberg that the SA must be brought to heel ASAP, or he would declare martial law in Germany and let the army run the show, which would pretty much mean the end of the Nazi party. The fate of Ernst Röhm and the SA was sealed from that moment. 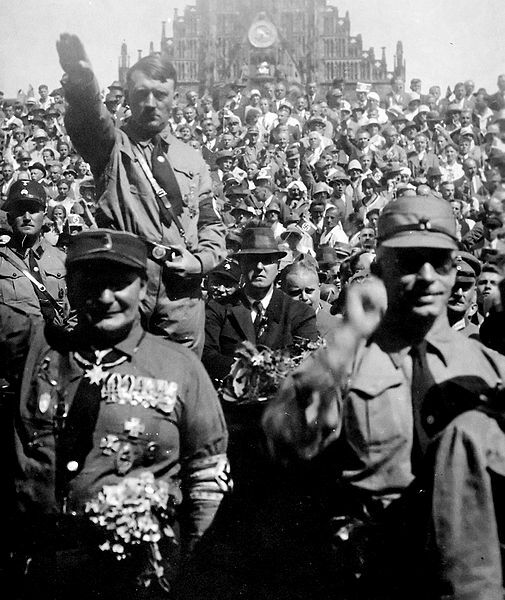 On the evening of June 30, 1934, which became known as the Night of the Long Knives, Hitler made his move. In the village of Bad Wiesse, the SS raided a hotel where Röhm and his buddies were hanging out for the weekend. Members of the SA were dragged from their beds and executed on the spot. All except for Röhm, who was arrested by Hitler himself, brought to Munich, and given a revolver to kill himself instead of being executed by someone else. Röhm refused, saying if Adolf wanted him dead so badly, he’d have to do the deed himself. Since Hitler couldn’t bring himself to kill his old friend, he sent in a minion to shoot Röhm in the stomach at point-blank range. Hitler also took the opportunity to assassinate anyone that he didn’t like, or had crossed him, or looked at him the wrong way on June 30 – July 1, 1934. At least 200 hundred people were killed, though some historians estimate that as many as 1,000 may have lost their lives during Hitler’s purge. They say that Hitler in his early days unsuccessfully applied to enter art school 2 times and due to poverty lived in a rat infested flat. Imagine how history may have been different if he had been accepted. They say that those who stored and cataloged art that he took from various countries could not understand how someone could have such an appreciation for art yet be so ruthless. Did Hitler commit suicide and was he once spared by his enemy who had a gun pointed at him and once left the safety of a trench only to watch the rest die in a shelling and escaped an assassination attempt with minor injuries from a bomb blast. They say that because of these incidences he considered himself for a higher purpose like the extermination of 6 million Jews, men, children and women and the creation of superior race. Did he borrow the Nazi symbol from the Indians.